Earn $76.47 in Rewards credit (7647 points) What's This? 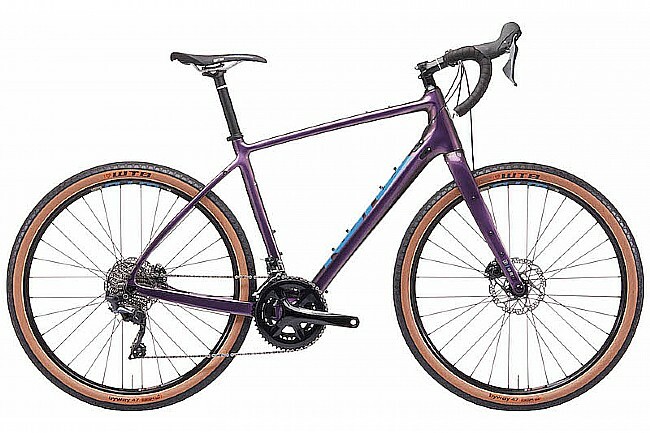 Kona's 2019 Libre Carbon Gravel Bike is part road bike, part mountain bike, part gravel grinder, and totally badass. A Shimano 105 2x11 drivetrain ensures maximum gear range, while WTB 650b tubeless ready wheels provide ample clearance for bigger, better tires. The Verso Carbon Touring fork is one of the only carbon forks on the market that allows for multiple rack and fender mounting options. Frame: Kona Race Light Carbon. Fork: Kona Verso Full Carbon Flat Mount Disc. Cassette: Shimano 105 11-34t, 11spd. Brakeset: Shimano 105 flat mount (calipers), Shimano RT54 160mm/160mm centerlock (rotors). Seatpost: Kona Deluxe Thumb w/ offset 31.6mm. Wheelset: WTB KOM i25 TCS. Rims: WTB KOM i25 TCS. Axles: 100x12 (front), 142x12 (rear). Tires: WTB Byway TCS 650x47c. Manufacturer Warranty: 1-year limited on bike; lifetime limited on frame.